I am entering into a long natural gas futures trade for the November contract. Entry price was 2.933 and entry time was 4:14 (my time). As always, a protective stop was used to ensure excessive loss does not occur in the face of erroneous judgement or errant market deviations for whatever reason. I've been waiting for a long entry into a natural gas futures trade since Monday evening, and it appears as though the opportunity has presented itself. Observe the following 60 minute chart. 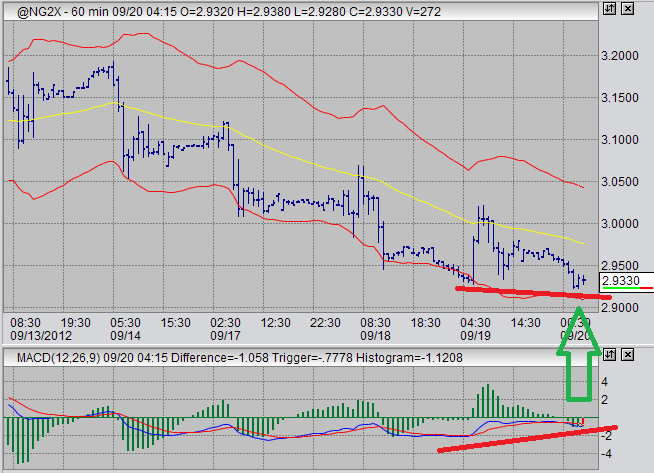 What we are observing here is an MACD divergence. Prices have made a bottom, and MACD has begun to demonstrate weakness in the downward momentum. This is potentially signalling that an upward movement will follow. The time frame for this particular trade is for my exit target to be reached in a few days, less than a week. My exit signal will be another MACD divergence indicating that prices won't go higher. However, I will also be trailing my stop and this could trigger my position to be flattened at any time if prices move dramatically. In other markets, I've been following sugar, the US dollar index and gold. Since the economic stimulus announcement recently, my hopes for the US dollar index have been altered. I am still looking for an opportunity to buy into that market for a larger upward movement, but I am definitely taking a step back and exerting much more patience. In the gold market, I am still waiting for prices to return to the weekly moving average I have set. I need to see gold prices drop substantially before buying into that market. Sugar trading is getting very interesting. I am watching this market very closely now. Things are getting very interesting with sugar prices. I am looking to buy into this market on the long side, and I could see my signal that sugar has bottomed come up soon. If you are interested in this market then check in frequently, because I feel as though the signal I've been waiting for could be around the corner.